Gel hot and cold packs are extremely handy for providing hot and cold therapy to soft tissue injuries. Chilling them is very easy, but heating them safely requires just a little more care. Most hot and cold gel packs are a rectangular or lozenge-shaped sealed pouch made of plastic or nylon. They contain a water-based gel, which can be heated or cooled depending on your requirements. Chilling one is as simple as putting it in the fridge for half an hour, but heating one requires you to either soak it in hot water or cook it in the microwave. 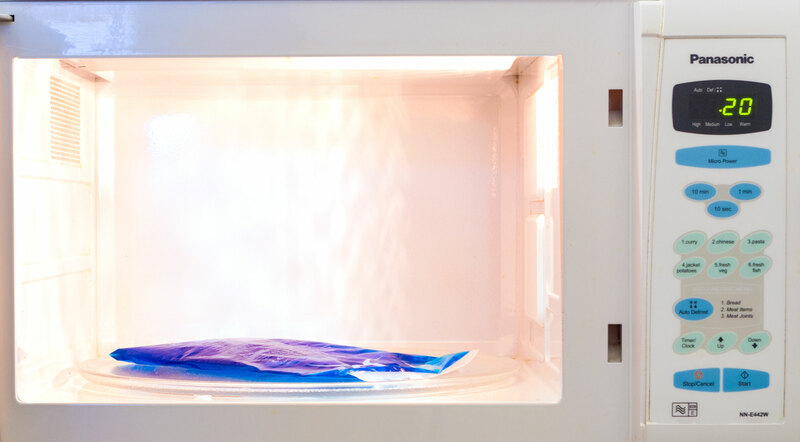 We recommend the microwave method because it is safer and faster. Lay the gel pack flat in the microwave and heat for 20 seconds at medium. Once it has cooked for 20 seconds, remove the gel pack USING AN OVEN GLOVE OR TOWEL to hold it. Remove using a towel or oven glove and manipulate the pack to distribute the heat. Re-Flatten the hot and cold pack and return to the microwave for another 10-20 seconds, keeping an eye on it at all times. Remove the pack (again with a towel or glove), check the heat and squidge as necessary. If the gel pack still isn’t hot enough, return to the microwave and repeat the process of alternating between 10-20 second bursts of heating and bouts of squidging the pack in the glove or towel. It might take a few goes. Once the hot and cold pack is warm enough, wrap it in a towel or place it in a cover and then lay it on the body part you wish to treat. The hot pack is intended to be applied to your body, so you really don’t need it to be that hot or you risk burning yourself. Medically, there is no advantage to anything more than gentle warmth. Don’t be tempted to leave the pack in the microwave for more than 10-20 seconds at a time. The plastic type in particular may melt at the edges if you heat one too aggressively. It’s important to do it in short bursts and to move the gel around the pack between each burst. Do make sure to watch the gel pack the whole time it is in the microwave – that way, if you do happen to over-do it, you have the chance to step in before you get gel all over the inside of your microwave. In the unlikely event that you do manage to split one of these packs, allow the gel to cool completely before attempting to clean it up. And don’t panic – the gel is non-toxic. Again, always handle the pack through a towel or oven glove and do not apply it directly to the skin without some kind of cover. Follow all the instructions above and you should have no problem in getting a nice warm hot pack ready for use within a couple of minutes. If you’d like to buy any gel hot/cold packs we sell a range of them in various shapes and sizes. You can purchase them here. We also sell a range of disposable and reusable covers for hot/cold packs. Gel eye masks are very helpful for soothing eyes. Even it is also useful for swelling and puffy eyes. These are some great instructions to heat gel pack. Thanks for sharing. Agreed. Although you don’t really need an eye mask shaped one – a standard gel pack works just as well. When used hot, they’re very useful for treating the symptoms of blepharitis and generally ‘un-bunging’ the meibomian glands. Just remember to wrap the gel pack in a *dry* towel first, or you’ll end up with burns on your face! Can you go straight from freezer to microwave? Yes – but still follow the instructions as written. It’ll just take a few more goes to get it warm. Don’t be tempted to nuke it for longer bursts or use a higher heat.